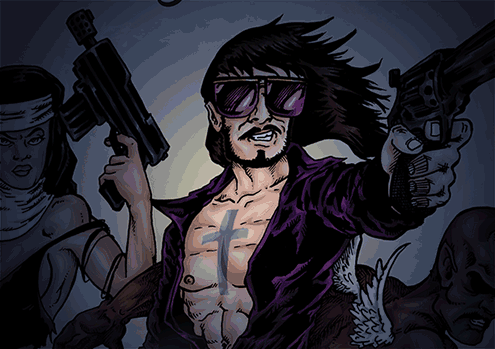 I’ve mentioned Nick Marino & Daniel Arruda Massa’s Holy F*ck comic before. Issue one is due on the stands within the next few weeks at your finer local comic shops. If for some reason you can’t get out to your LCS, Comixology has Issue # 1 and Issue # 2 available right now. I recommend ’em, they’re hilarious, well-written and beautifully drawn and fantastically blasphemous. However, if you can pick up a physical copy, do it so you don’t miss out on the awesome pin-ups that will be featured in the print editions! Every issue will have two pieces of pin-up art. I’d especially highly recommend Issue # 3, which will have pin-ups by friend of the blog JB Sapienza and some dude name Eric Shonborn. Oh, hey, that’s me! So, even though I’m gonna have some work featured in this comic, I’d still totally recommend it. That’s kinda how this all came about. Nick has been an online friend for a bit, and we’ve even been in the same room numerous times (though never spoke) as we had both attended numerous SPACE (Small Press And Comic Expo in Columbus, OH) shows, often buffered by a Brian John Mitchell. Nick is a highly creative and energized comic fiend, the creator of many web & minicomics and podcast networks. So, when Holy F*ck was announced, I was pretty much already on board. Then he and Daniel Arruda Massa began posting prequels to the series online. They were short comics that filled in the gaps of Jesus Christ’s life post-crucifixion and up to the time where Holy F*ck begins. They are delightful. I believe it was the comic in which Jesus and Satan are luchadores that completely won me over, and caused me to say “out loud” that I desperately wanted to draw a pin-up for the trade paperback. I needed to get some Jesus fan-art out of my system. Apparently, that got the ball rolling. Nick and his publisher worked it out to get some pin-ups included in the comic, and here we are. So, the above is not the full pin-up, obviously. You’ve gotta get the comic for that. Once the comic is closer to publication, if you haven’t bought it (Buy every issue! Buy every variant cover! ), and you ask nicely, I’ll maybe think about showing off the full art. But here’s a teaser, just my way of helping put the “Christ” back in “Christmas”! Heyyyyyyyyy Issue number 3 is where it is at. i too have heard good things about this comic book that is called Holy F*dge, and especially about the third issue in the miniseries of four issues.